Now you can listen Austria radios and if you don't find your favorite one you can ask for it and we will do our best to add it! Listen your radio in Background while you travel in others iPhone apps. - Share the radio you are listening in your Facebook and Twitter accounts without stopping the audio player. Now your friends can know what you are listen to. - Radio website. Travel in the radio website while you are listen to it. - Set your favorites radios. 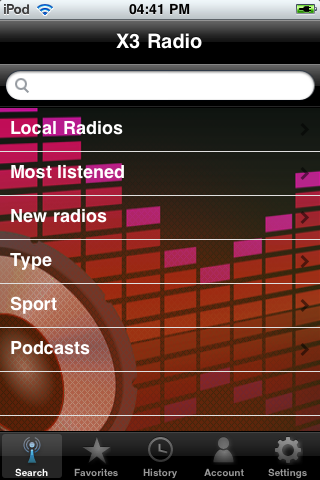 - Search by a radio name or by your favorites radios. - Sync radios list. 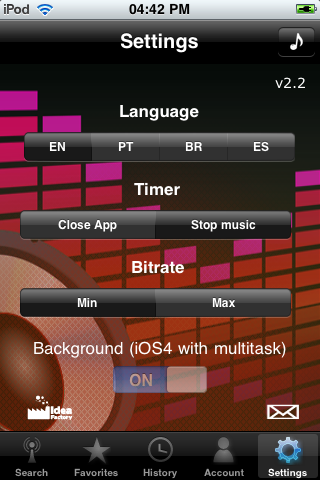 This feature will add new radios and update the old ones in you radio list. The radios that you asked for will probably appear then. - Radio suggestion. If you don't find your radio in the app you can ask for it and we will try to insert it in the system. You'll also receive an answer sent by us. - Timer. Set a time value and when it gets timeout the app will close or only stop playing, you choose! - Language. You can change the app language. This app is translated into the following languages: English, Portuguese, Brazilian Portuguese and Spanish. - iOS4 ready. Works in background (iPhone4, iPhone 3GS and 3rd Gen Ipod Touch 32/64Gb with iOS4). We are always updating the radio list! Radios that don't work will be removed or updated as soon as possible. Suggested radios will be added to the list. At this moment is not possible to play radios that use Adobe Flash Media Server (rtmp). Our I&D lab is trying to solve that issue. IMPORTANT: This app tunes only internet broadcasts radios. It's not possible to tune waves broadcast. Only internet broadcasts. Where The Hell Am I! ?